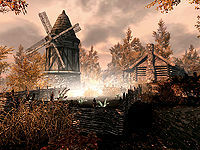 Sarethi Farm is a farm between Riften and Ivarstead that has learned to cultivate nirnroot. It consists of one interior zone, Sarethi Farm. After the eruption of the Red Mountain, the Sarethis moved to Skyrim and founded this farm. Their daughter Avrusa Sarethi once studied as an apprentice in Skingrad under Sinderion. He randomly showed up on the farm and set up a field research lab there for several decades. In exchange, he taught Avrusa everything he knew about nirnroot, leading to her unique ability to cultivate the elusive plant. * Only appears if the Rift is taken by the Imperial Legion in The Battle for Fort Greenwall or Season Unending. There are a further three gourds in a cart by the crops. You enter into a room with a cooking pot and a small table with two chairs opposite you, and a set of double doors on your left. On the table are a salmon steak, a loaf of bread, a bottle of alto wine, and an eidar cheese wedge. There is a dresser with two samples of lavender on top, to the right of the exit with a barrel next to it. There is a large set of shelves on the west wall, with an open crate on the floor between the shelves and the barrel. There is also a staircase down to the basement with a barrel in the corner above them. In the open crate are two blue mountain flowers, jazbay grapes, two juniper berries, two more lavender, a red mountain flower, a snowberry and tundra cotton. On the shelves are three gourds, three loaves of bread, two goat cheese wheels, an eidar cheese wheel, a sliced eidar cheese, an eidar cheese wedge, two goat cheese wedges, eight potatoes, a green and red apple, a sweet roll, two boiled creme treats, a potion of minor healing, and a potion of minor stamina. Hanging above the dresser are two of each dried elves ears, garlic braids and frost mirriam. Through the double doors is a double bedroom containing two single beds against the north wall, a chest in front of the bed on the left, a barrel and wardrobe opposite, and a wall shelf on your right all as you enter. There is a medium coin purse and a bottle of Nord mead under the bed on the right. The wall shelf holds two bottles of wine. 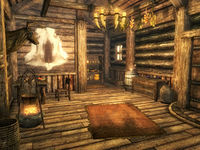 Downstairs is an alchemy lab, a single bed, a small set of shelves containing a solution of strength, a potion of health, a paralysis poison, a philter of extra magicka, a restore health potion recipe, a paralysis poison recipe, and an alto wine. There is a woodcutter's axe under the stairs. Next to the alchemy lab is an open crate containing a lavender, two deathbells, a fly amanita and a bleeding crown. 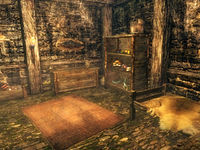 There is a dresser with a copy of Spirit of Nirn on top, and finally another large set of shelves containing two nirnroot, two swamp fungal pods, a tundra cotton, an imp stool, a nightshade, a bleeding crown, a blue mountain flower, a blisterwort, a scaly pholiota, a dried elves ear, two Nordic barnacles, a thistle branch, a dragon's tongue, a canis root, and deathbell. Above the lab is a wall shelf containing two Nord mead and two sacks. Two iron ore veins are to the west of the farm on the far side of a pond. An additional iron ore can be found to the north-northeast. Outside, beside the farmhouse, there are eight nirnroot plants within the farm's fences that you can see glowing from across the stream. This is the only single location in the game where nirnroot can be found in such quantity. After completing A Return To Your Roots, Avrusa Sarethi will start growing some Crimson Nirnroot at her farm. After completing the quest, simply harvest whatever Nirnroot is growing currently. After it grows back, it will be a mix of the regular and Crimson varieties. If the civil war questline is completed in favor of the Empire, an Imperial soldier will appear to guard the farm, but the Stormcloak-aligned Rift guard will not be removed. This results in a fight to the death between the two. Esta página foi modificada pela última vez à(s) 18h37min de 11 de janeiro de 2016.